"Spectacular, but a little melancholy"
'You know, lots of people with big ears are famous!' Timothy Q. Mouse Get ready for the new wave of Disney classics being made into live-action films. The extensive nature of Disney’s animated classics vault offers the studio a multitude of options when considering these remakes. With the success of Beauty and the Beast and The Jungle Book, it is no wonder the mouse house would consider all of their back catalogue as options for a new vein of revenue. To choose the story of the large-eared pachyderm with racially offensive crows and psychedelic pink elephants may not seem like an obvious choice until it was announced that Tim Burton would be directing. Due to the blockbuster success of Alice in Wonderland (2010) for Disney and his reputation for creatively re-imagining classic children’s tales, this could be a combination that gets the lift that it needs. For those who are not as familiar with the original 1941 production, the gestation of the story begins at the Medici Brothers circus. A struggling outfit of misfits who are trying to find that one thing that will bring the crowds back to the centre ring. Holt Farrier (Colin Farrell) had been a significant drawcard as a stunt horse rider for this big top family, but after returning from the war with one less arm, he found he would need to adapt to his new role at the circus and with his family. His wife had passed away from influenza while he was away, but his creative and self-reliant children have managed to survive until his return. Milly (Nico Parker) and Joe (Finley Hobbins) have established their own roles in the circus, but it is the birth of Mama Jumbo’s baby that solidify this precocious pair their place in the circus. With the anticipation of the cute baby elephant, Dumbo was meant to be the newest sideshow attraction for Max Medici (Danny DeVito). When it is discovered that the miniature pachyderm's ears are freakishly oversized, the circus owner decides to add Dumbo to the clown’s act. Unbeknownst to this band of performers is that the young elephant possesses a special skill, he can fly. The Farrier siblings work to harness these ariel skills and wait for the right time to showcase Dumbo’s flying abilities. That time comes during the re-opening clown performance after a tragedy occurred to temporarily close things down. On the night, everything goes wrong for the unveiling of this flying spectacle and then suddenly Dumbo flies to the amazement of all in attendance. 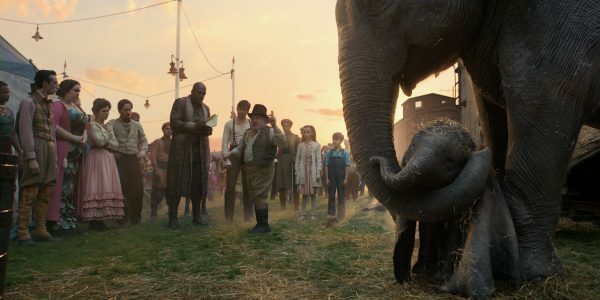 The news of the little flying elephant spreads across the country quickly and captures the imagination of the theme park owner, V. A. Vandevere (Michael Keaton) and an aerial artist named Colette Marchant (Eva Green), who see the financial potential of the flying elephant. For those familiar with the original story of the circus, you may notice that Tim Burton has kept the heart of the tale, but has added in subtle changes. The animated film was a world of talking animals, while the live-action version puts the focus on the humans and the animals merely show-off their talents. While the script manages to incorporate many of the famous lines and songs from the first film, this version is more culturally sensitive and adds modern twists to appeal for today’s audiences. For fans of the eccentric and inventive director, this production will deliver on all they would expect from this unique visionary. One of his signatures would be a dark melancholy that overshadows the overall tone of the movie. To lift things out from under the solemn feel are the magnificent visuals that manage to draw the audience into this otherworldly circus spectacle. These familiar techniques of staging and tone cause the whole experience to be rather serious, but still captures the themes of acceptance, family and community which are at the heart of this magical journey. One aspect that seems to have gone missing from this film is the jovial underpinnings usually associated with Burton's style. Even with the comedic talent of DeVito and Keaton on board, the film has a look and feel that may be difficult for the younger set to embrace. Dumbo maintains the elements of a classic Disney tale, a life lesson that is wrapped up in a magical adventure. The characters associated with the circus, the lovely family connection and a flying elephant will tick the boxes for an engaging family night at the cinema, but the darker nature of this production may keep children’s imaginations from taking flight. 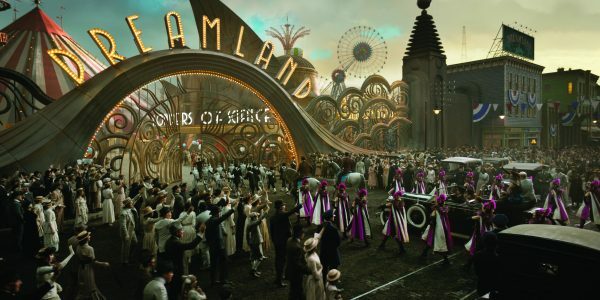 The question should be for Tim Burton, you gave us a flying elephant, but where are the joy and wonder that should come from that experience? Where are the wonder and awe?